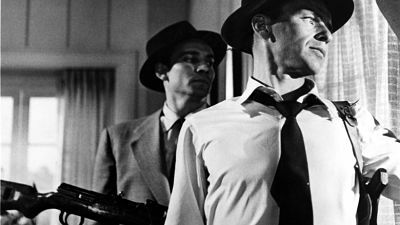 Frank Sinatra (The Manchurian Candidate) gets nasty as a murderous gangster in one of his darkest film roles ever in the 1954 film noir crime drama Suddenly. Terror comes to the sleepy small town of Suddenly, California when cold-blooded assassin John Baron (Sinatra) and his accomplices take a family hostage in their house atop a hill overlooking the local train station where the President is due to arrive as part of a whistle-stop tour. Standing between Baron and his plot to assassinate the President when he emerges from the train is the town sheriff (Sterling Hayden, The Killing), who engages in a battle of wits, wills and fists with the cunning and increasingly psychotic Baron. Directed by Lewis Allen, Suddenly co-stars James Gleason (The Night of the Hunter) and Nancy Gates (Some Came Running). As Suddenly’s copyright was never renewed following its initial release, it fell into the public domain and has been widely available on DVD from a handful of distributors for years. The Film Detective’s edition is restored in HD from original 35mm elements and is presented in full screen with the original 1:75 aspect ratio.